This quilt was made for my living room (after a round of trunk shows). The colors are so soft and soothing…which is just what my living room needs this very second now that the Halloween décor is down. The fabrics are a mish-mash as usual. 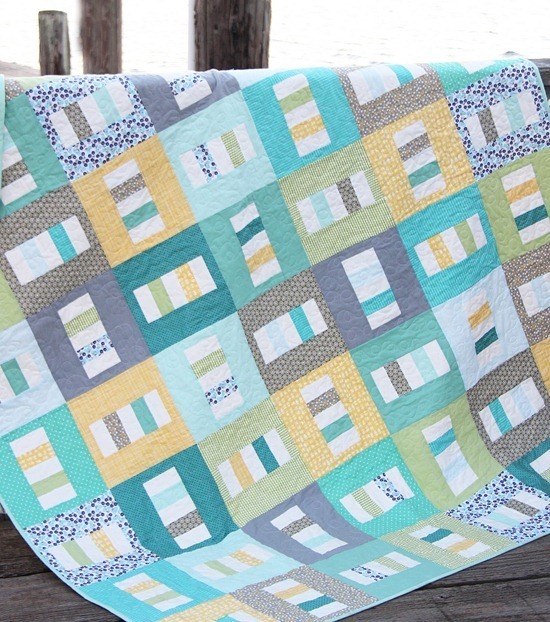 For quilts like this one I plan out the color scheme I want first…then I choose fabrics based on those colors, instead of sticking to just one or two fabric lines. I love pulling and choosing fabrics, but there’s nothing wrong with sticking to one fabric line either! This one is very beginner friendly and comes in 4 sizes. I quilted it with a loopty-loop pattern on my own machine. Luckily it’s a really tough pillow as its been jumped on about 100000 times by the 2 year old that rules my house. The Boardwalk pattern can be found here in PDF or hard copy. Beautiful quilt. The colours are almost beachy. The name is perfect for this new pattern. Love it! Very nice! Love the colours used, its got a nice cool feeling to it. 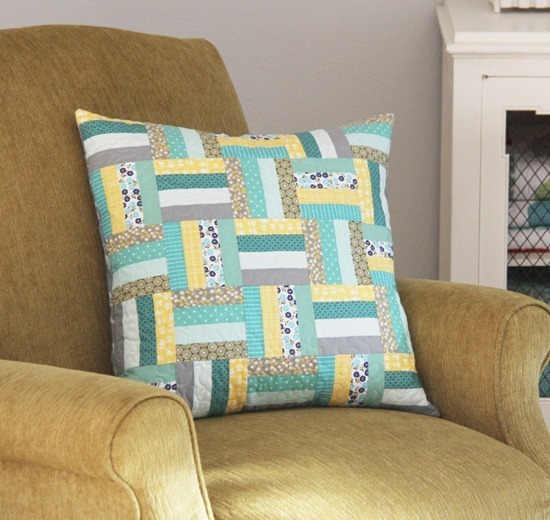 Like the colors you used and love the pillow! Beautiful quilt, Soft and comfy but certainly not dull. Love the colours and the pattern and the pillow. I love your quilting! Would you share what thread you use? It looks like it just melts into the quilt! Delightful! The colors are soothing! You have the cutest patterns. Just purchased your Seville pattern to make a quilt for my daughter. Now need to figure out some fabrics :) I like to pull fabrics but feel like I over think the process. Love it when it all comes together!!!!!!!!!!! The colours are so dreamy and restful, very easy on the eye and easy to live with! Wonderful colors. 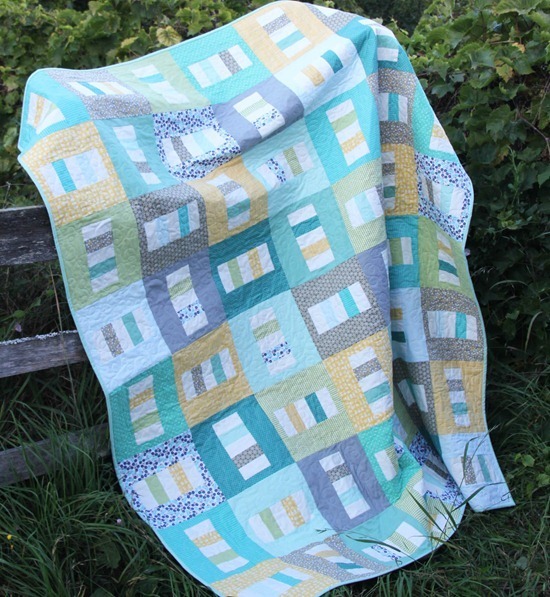 The first quilt I ever made many years ago was the pillow pattern and it was called Split Rail. 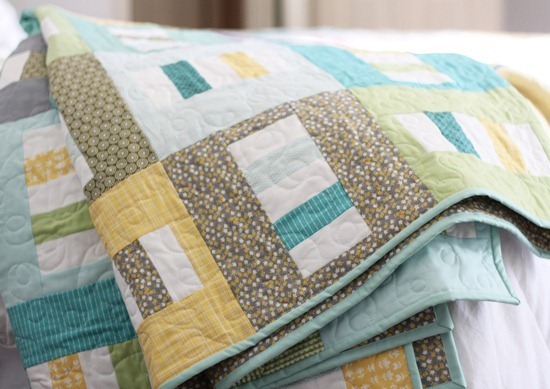 Love the colors you choose for this very pretty quilt! Love this quilt the colors are soothing. Love the matching pillows. I love the soothing colors too! Very pretty!! I really like this quilt and the pillow is great, too. Beautiful quilt and pillow! Love the colors and the name is perfect! Your patterns and fabric choices are just flawless. Wow, I just love those colors! 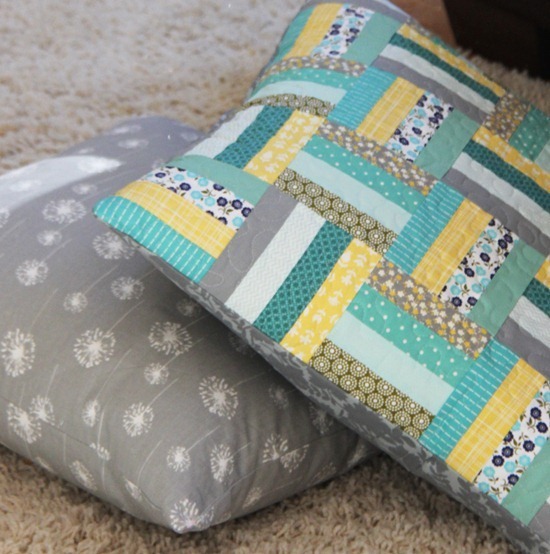 I want to make one of those pillows, even though I have really no need for more pillows… Ah! I LOVE everything about this quilt. I don't comment much but had to on this one- beautiful pattern, fabrics and LOVE the quilting. Well done!! 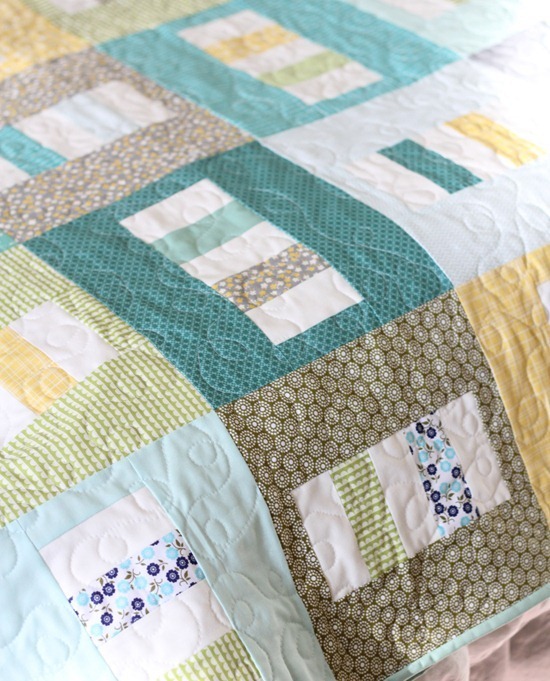 Lovely quilt and great choice of colors. It will be loved by everyone. Great pattern and your fabric choices are so lovely and soothing. The added pillow instructions are wonderful too. Hi! I think you are one of the best quilter I've ever seen. You use colours very well. Love it! And I LOVE the pillow! GEE!!! I am in love with the colors!!! You are so right, they are soft and soothing! I've decided something: since you are so good at taking a mishmash of different lines and patterns and making them look good together and I don't think *I* am good at that, I have an idea: everytime you make a quilt, just cut a little more and put aside a little quilt kit for me to buy from you. That way all the thinking is done for me and I get a great colors and patterns in my quilt just like yours. Okay? Thankyouverymuch.